Of course, the start of Guiding in 1910 automatically meant the start of Guiders - so one could say they are the second-oldest section! Initially, Guiders had to be ladies of suitable standing in the community - this usually meant unmarried daughters from the local 'big house', well-bred older maiden ladies, or the wives or daughters of professionals such as clergy, doctors, lawyers, etc. They were appointed both because they were the sort of people who had time to devote to the work (they were of a class who both did not need to take paid employment and would be embarassed to be seen doing so, but would equally be thus expected to devote their lengthy free time to 'good works' in the local community as 'noblesse oblige'), and because they were considered to be suitable role models for the girls in their charge - it was felt that the working and middle class girls would naturally pick up good manners, diction and habits from the rare opportunity of contact with respectable upper-class ladies, and from their supervision, advice and example. In an era when class differences were very obvious, familiar, and accepted as the natural order by those of all backgrounds, many parents would be delighted to have the opportunity for their daughters to mix so closely with one of the family from the 'big house', something which would never otherwise have happened. Another advantage was that these ladies often had free access to land, which could be made available for camps, picnic hikes and wide games, and also their endorsement and approval of the Guides and their activities would help ensure that guiding was viewed positively within the community as an appopriate hobby for the respectable young girls of the area - since they were seen at the arbiters of good taste and appropriate, genteel behaviour. Registration of units and members started in July 1910 and the first steps towards organisation thus began. 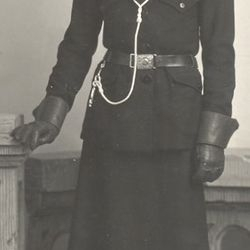 The initial Guider uniform was very formal - the thick navy serge 'Norfolk' jacket and skirt with the large brown gauntlet gloves, and the wide-brimmed hat with it's pheasant feathers caught up in the fold of the brim, the row of 'Service Stars' above the left pocket indicating the number of years service, their felt discs showing how many of those were as Brownie, Guide or Ranger. Most Guiders would carry a long umbrella or walking stick when out in the country. Commissioners were soon appointed, initially at County level, and soon in Districts too, to support the Guiders and assist in communications - these were invariably selected from among the gentry. 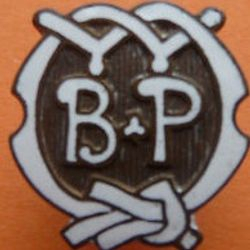 The original Guiders had to adapt 'Scouting for Boys' using their own initiative, both in terms of what they and the girls should wear, and in choosing and organising suitable weekly activities for their units - as at first the only official information on 'Guides' was contained in two pamphlets (known as 'pamphlet A' and 'pamphlet B'), and the article in the Heaqdquarters Gazette of November 1909 - and it wasn't until the publication of "How Girls Can Help to Build Up the Empire" in 1912 that full, clear guidelines on how units should be run and what topics should be taught became available, so unit programmes necessarily tended to follow the hobbies and interests of the Guider, and her interpretation of the instructions in "Scouting for Boys" and "The Scout" magazine. There was also now a sketch and description of the Guider uniform which helped to clarify what was intended - before then there had been various wildly different interpretations of the rather vague directions given! In those days there were also limitations in programme based on what was socially acceptable for girls to do - in the early years many unit 'camps' involved staying in either hay-filled farm barns or outbuildings, or in village halls, as it was considered unwise and potentially risky to the health, for girls to actually sleep in tents! 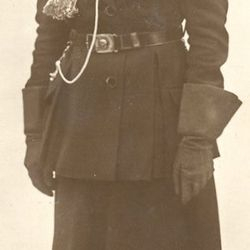 By the next handbook in 1918 the Guide Captain's uniform was slightly more specific - "a navy blue Norfolk coat and skirt with brown leather belt, navy blue felt hat turned up at the left side, and a navy blue shirt". 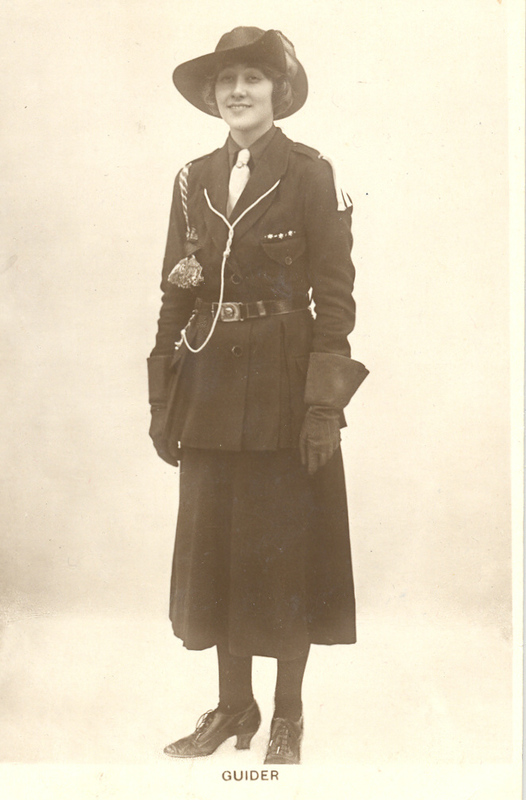 "Her tie can be of light blue or of Company colour, her distinguising mark a bunch of white ribbon on the left shoulder, also a navy blue cockade on the left side of the hat with a green badge brooch on the knot of the tie" as shown in the photo above taken from that book - so pheasant's feathers were out! Lieutenant's uniforms were similar but their badges were plain brass rather than having the green enamel. Commissioners wore white shirts, with "a cord on the left shoulder with badge on the left breast and a cockade on the side of the hat with tie". 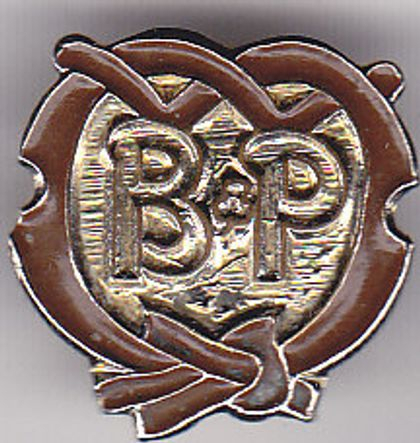 Brownie Guiders wore brown ties, there was an Owl's Head badge in place of the green badge for Brown Owls, and a badge featuring a full-length Owl for Tawny Owls. 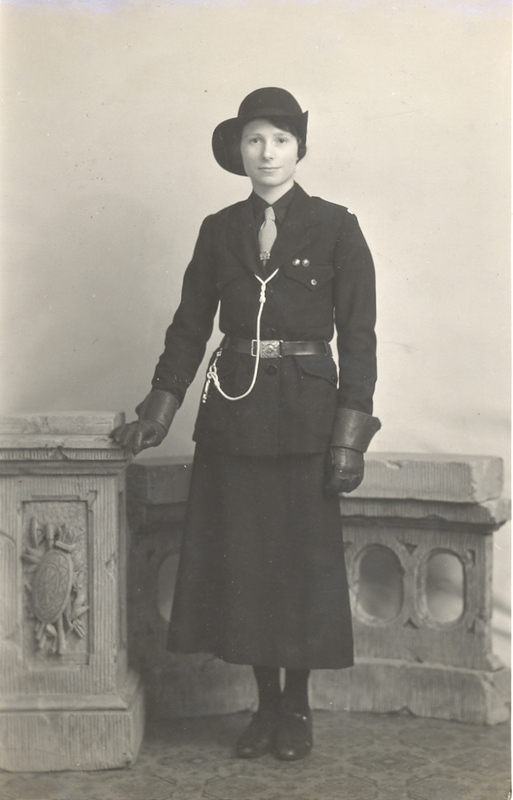 Headquarters were now able to supply both off-the-peg and tailored uniforms from their dedicated tailoring department, staffed fully by association members - and many other useful items could be ordered there too. The first world war didn't directly impact on Guiders at first, although many did get involved in work to fundraise for the Red Cross and other charitable organisations, and in making clothes and presents for the soldiers at the front, as did young women in general. Most Guiders were not of a class to find themselves working in factories, as many working class women did, although some served as nurses, especially if they had had some first aid training, or their family home was being utilised as a war hospital or convalescent home. However, a major side effect of the vast numbers of young men killed in the war, and by the flu epidemic which followed - was the number of single women it generated, both widows and spinsters. 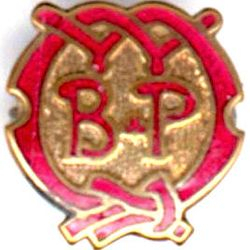 It may well be that the massive expansion of Guiding in the 1920s was, sadly, largely down to the numbers of young women who were not married and busy with children as they had hoped or expected to be, and who were of a class which made taking paid work socially inappropriate - voluntary work such as Guiding provided an outlet of fulfilling activities to occupy their extensive free time. 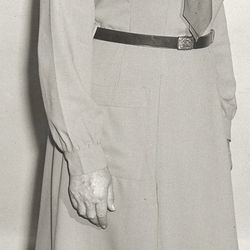 By the 1920s, the Guider's uniform suit was firmly established, and a full system of shoulder cords and hat cockades had been established to distinguish between the different posts and ranks. County badges appeared in England, along with Country badges for Scotland, Wales and Ireland (they weren't allowed to have separate badges for their Counties, and still aren't). Cotton overalls became available for camp wear, which were more practical, especially in summer, as women's fashion rules generally became more relaxed over the decade - it was no longer considered necessary for younger Guiders to wear their thick stockings on the campsite during warm weather (provided the site was suitably secluded), although it was made quite clear that they were definitely to be worn on any visit offsite, however minor the visit or of whatever duration, and no matter what the temperature! From the early years, some local training was available, through books or in the form of gatherings of local Guiders in areas and in Counties, or at the specially arranged 'training schools' organised by Counties, sometimes at schools, drill halls and the like, sometimes using rooms or outbuildings at the County Commissioner's house (which was often what we would now term a 'stately home'). There were also the official 'correspondence courses' on all sorts of topics including drill and games which Guiders could enter for, with their written examinations - but it was really with the opening of the training centres at Foxlease (1922) and then W addow Hall (1927), with their regular week-long residential training courses for the various sections, that Guider training really took off. 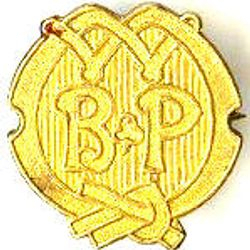 The original pages in "Home Notes" magazine had been replaced with a separate magazine, the "Headquarters Gazette", which would become "The Guider" and then eventually "Guiding", giving useful training articules, full information on badges, rules updates and notices, training articles, pages for groups such as Rangers, Lones and Extensions, and other items of interest - and in the early years the Girl Guide Gazette incorporated County or Country news sheet inserts in some areas, such as the one for Scotland which started in 1920. Qualifications gradually became available for Camping, and for Indoor Holidays, as it became obvious that some standard-setting and regulation was requred to ensure that camps were run properly and that appropriate safety and health standards were maintained - at this time it was almost automatically expected that every Guide unit would go to camp for a week or fortnight each summer unless there were really strong reasons why it couldn't be managed - and it had naturally been found that some Guiders were more knowledgeable about camping and more capable of managing the complex arrangements for cooking, washing, toilets etc, than others were! 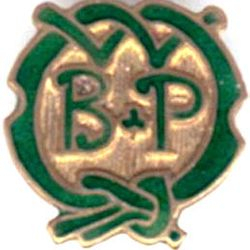 By 1920 Guiders who wished to take their unit to camp had to have the Senior Camper interest badge, and soon afer a system of Advisers was also set up to help organise suitable camp training, and to encourage the gaining of camp qualifications across the country, in order to raise the standards, working under a national Camp Adviser who was appointed each year. During the late 1920s and early 1930s a lot of standardisation was achieved - new badges and qualifications were introduced, rules were stabilised, and systems implemented to improve administration and organisation. The rule book, "Policy, Organisation and Rules" was regularly updated in the light of experience, and many conferences and discussion groups were held. During World War 2, major difficulties were caused by Guider shortages - 'The Guider' magazine had actively encouraged all Guiders to register for war work during the 'crisis' of September 1938 - as a result, when the war finally broke out in September 1939, and given the skills and training they had to offer, a large number of Guiders were among the first to be called up to serve, often far from home, during the early days of the war. This left many units without Guiders almost overnight - and meant that the few older Guiders who were left - had to do what they could to support Patrol Leaders who were keeping their own units and sometimes the feeder packs running too, and also help to organise the war work efforts of the various units in their areas - especially in country areas where the influx of evacuees meant an overnight multiplication in the number of girls wanting to transfer into previously small rural units - an expansion from 8 to 60 Guides in a unit almost overnight was not unheard of, as suddenly every house in the village had children! 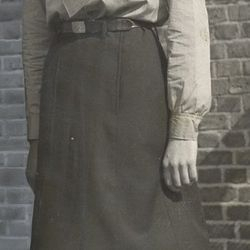 The vast majority of Guiders were involved in some kind of war work, as all women aged between 18 and 40 who weren't prevented by their family commitments were automatically called up to one of the women's services, for factory work, or for work on the land in the Land Army or Timber Corps. 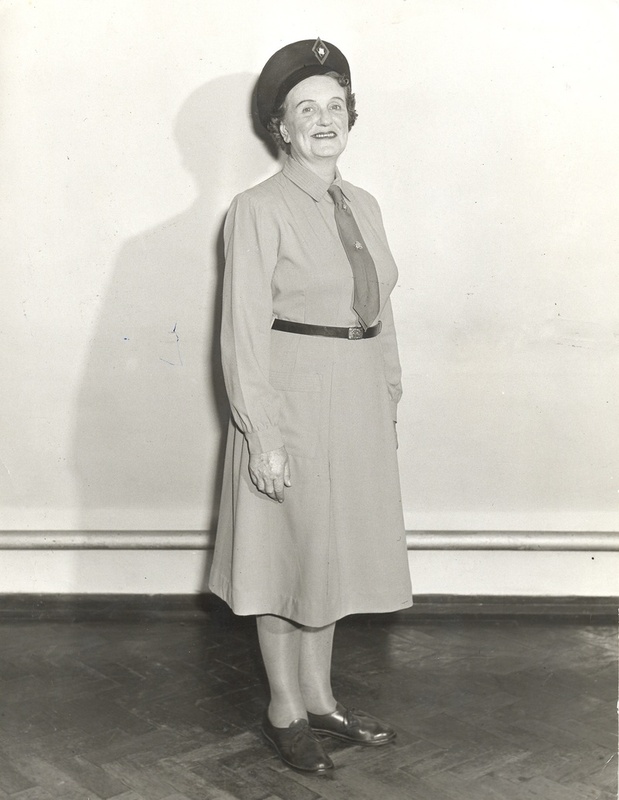 Those who were not eligible to be called up often worked voluntarily in jobs such as running static and mobile canteens, rest centres, first aid training, fire watching or doing ARP work alongside their normal occupations or family responsibilities, and free time was often filled in by making garments or collecting waste for recycling. Either option often left little time to spare for extras like Guiding, despite it's recognised national value. At first, all camping was automatically banned, due to the risk of Guide tents being mistaken for army encampments, but it was later allowed subject to certain restrictions - no camps were allowed near the coast or near to military installations, tents had to be camouflaged with paint or nets and pitched under trees, blackout regulations must be strictly obeyed - so absolutely no campfires or torches/candles after dark. In addition to the usual lat trenches, refuse pits, tent trenching and other standard camp earthworks of the day, a slit trench had to be dug which was deep enough for everyone to shelter in during air raids if required. Most camps had to be held within easy range of home - the rule was for safety reasons but it would have applied anyway due to the constraints of petrol rationing - so that lorries could be used for transporting kit and Guides if available, or if not, horse-drawn carts or the traditional Guide-powered trek carts were an option. Camp equipment was hard to come by - some had been requisitioned by the Army or Home Guard, other kit was damaged or destroyed by bombing - and replacements almost impossible to come by as the army had first call on any which was being manufactured. Quartermasters had their talents heavily tested in trying to make a workable menu from everybody's assorted ration coupons plus their food oddments brought from home - and arranging for food supply from shops near the site through the local Ministry of Food office - but they coped! Although the war ended in 1945, that year saw one form of war work just swinging into action - the Guide International Service, or GIS. From the middle of the war, many at headquarters had realised that winning the war wouldn't be enough - they judged that from past experience what they had failed to do at the end of World War I was to 'win the peace' - to help those in europe who were left homeless, starving, sick or as refugees by the effects of the war and it's disruption, and who in 1918 had been abandoned to cope as best they could. So it was, that Guiding was one of several organisations who started to train volunteers, ready to do relief work in europe and the far east as soon as war ended. Training started in 1941, in order to recruit people who had the necessary strength and adaptability to cope with the work and operate well as a team, taking on a wide range of tasks, not necessarily those they expected to be doing, or had any training for - even though at that time it was far from clear who would win the war or when it might end. Several teams were sent, and they worked to diagnose and treat infectious diseases, to sort and issue aid supplies, to prepare and repatriate displaced persons, to set up and run maternity and infectious disease hospitals, and to feed the starving. They also ran training camps to train local Guiders, enabling Guiding to swiftly resume in central Europe. 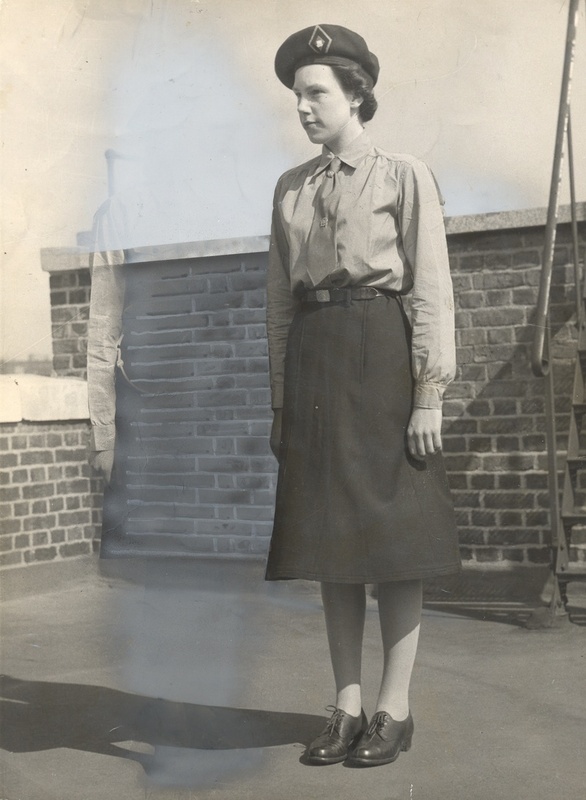 GIS members were some of the first people into the Belsen concentration camp, and the work of the GIS carried on until 1950 - long after other aid agencies had had to pull out - and all paid for by the fundraising efforts of the girls. 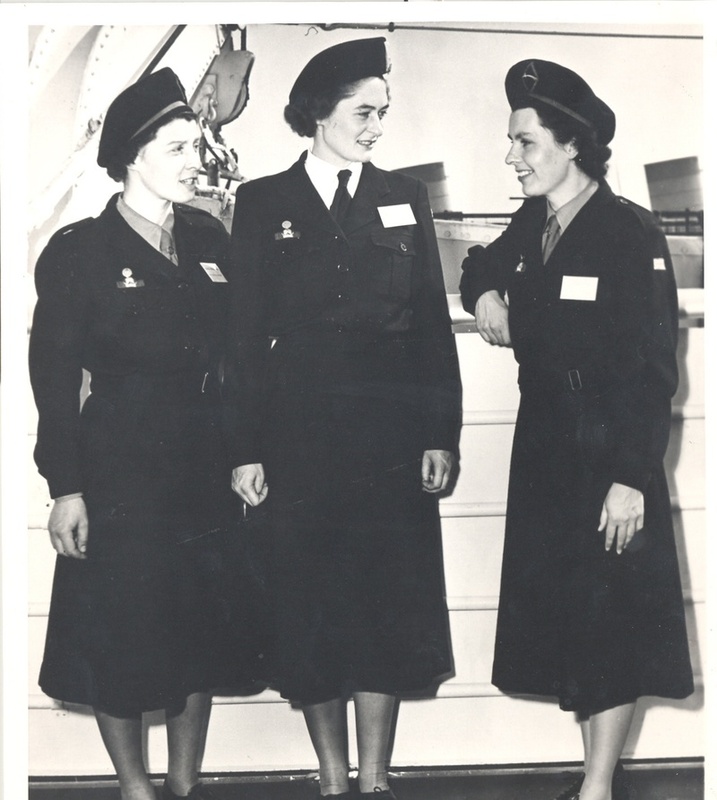 Guider uniforms also started to change, rationing permitting, with the old felt hats being replaced by stiff-fronted berets, the hat cords being replaced by a system of cockades - and a uniform dress in 'headquarters blue' also became available. Wartime also brought a certain breaking down of class barriers within Guiding. As there were fewer 'big houses', and more women were expected to get a job of some sort on leaving school, even among the middle classes, so more middle and working class women (especially former Guides) were becoming Guiders, albeit Commissioners still tended to be upper-class, especially at the higher levels. There were more opportunities for units, too, as weekend camping started, and Brownie Pack Holidays gradually became more common. Cars, too, gradually became more widely available, and more women had the chance to learn to drive (or had learned during the war) allowing transport further afield than trek carts or public transport could reach . . . 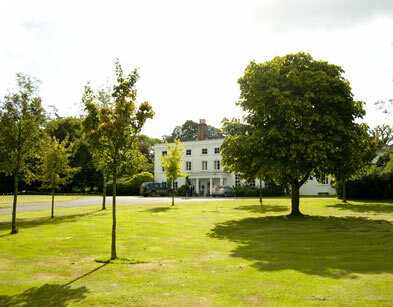 This also helped with training, making the training centres more accessible (Guiding was fortunate that their training centres were in most cases either leased to them on a peppercorn rent, or sold to them for nominal sums - as a result they tended to be large houses on country estates which were ideal in terms of camping and facilities for outdoor activities, but not always so accessible to those reliant on public transport). New innovations were also introduced, such as the mobile training van which was used during the 1950s to take the training to the Guiders, especially those in remote and rural areas located far from the existing training centres (a similar venture operated in Scotland in the 1990s to provide outreach to more remote areas). 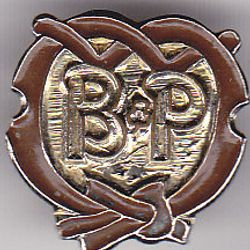 But the basic programmes were relatively unchanged from the early days of Guiding - Brownies still worked for their Golden Bar and Golden Hand, Guides for their Tenderfoot, Second and First Class, with every girl in the country all tackling the same tests - which some found relatively easy, and some found extremely difficult - and sometimes impossible despite their very best efforts. Although the idea was that every Guide would seek to become First Class, in actual fact fewer than 50% ever did, with some otherwise successful units rarely having any. 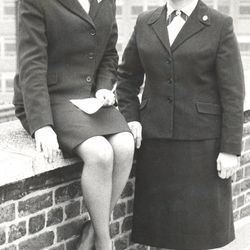 By 1968 it was time for programme changes, and following consultation with educational psychologists and others, a new 8-point programme was brought in, along with new uniforms and handbooks. Inevitably, it was not popular in all quarters, and some leaders and units struggled with the changes - but equally others thrived, there were now choices and options for all the challenges, which could be adapted to suit individuals and their locations, facilities and abilities, in place of the old rigid tests, so that the tests set could be geared to be a difficult but achievable challenge for each individual. 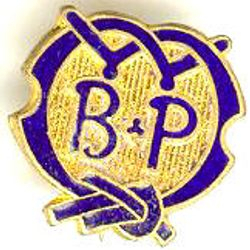 It was also possible for the girls to start to gain interest badges soon after they joined the unit, so Guiders found themselves involved in recruiting more testers and organising increasing numbers of badge tests. 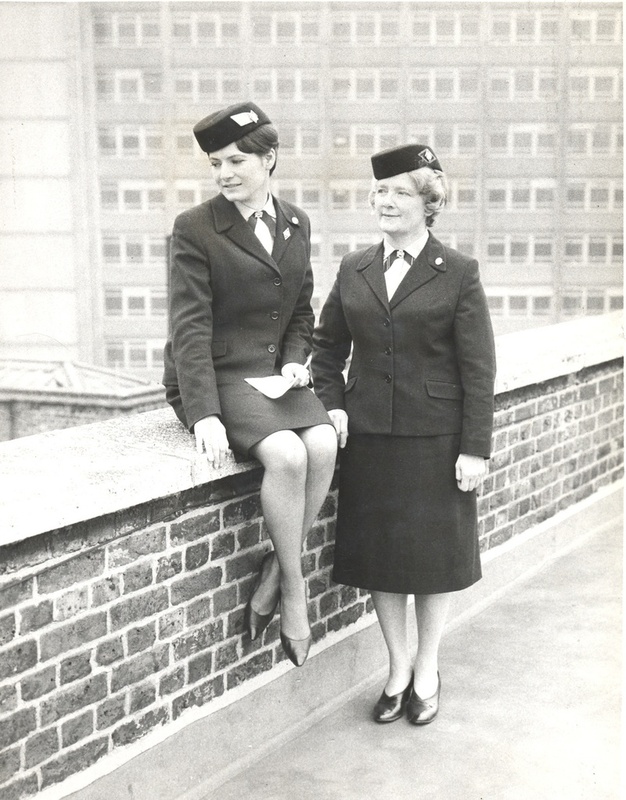 At the same time uniforms for Leaders were changing, with the lighter weight crimplene suit, blue fine-checked blouse and the 'air hostess' hat with it's 'hat felts' for Guiders and 'hat flash' for Commissioners and Advisers replacing the beret. In place of the older necktie was a ribbon tie - a plain vertical navy tab for unwarranted leaders, a plain navy crossover for Commissioners and Advisers, and a series of ties with coloured stripes for Guiders - with two stripes on each side for Leaders and one stripe on each side for Assistant Leaders - the colours being green for Rainbow Guiders, brown (later yellow) for Brownie Guiders, blue for Guide Guiders and Aqua for Ranger Guiders. 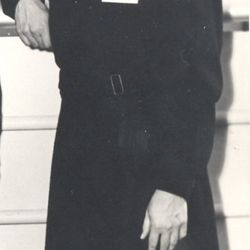 In 1990, as with all sections, a mix-and-match range of uniform was introduced for Leaders, featuring polo shirts, cullotes and joggers. 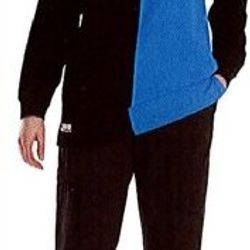 Since then, various uniform options have been brought out and retired, to the present time when there are uniform hoodies, polo shirts, and light-blue uniform shirts. Over the years, the role of Guiders hasn't really changed much. Our job is still to encourage the development of the girls, so that they become responsible, community-minded citizens - hence the widespread encouragement of service in the programme - through good turns in Brownies, community action in Guides, and citizenship in Senior Section. We encourage the girls to express their own opinions and make decisions for themselves, as the girls take increasing responsibility for planning and running their own programmes as they progress through the sections. We encourage teamwork and self leadership, increasingly responsibility and challenge. 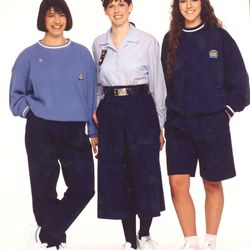 Nowadays we have a mix and match uniform which is based on practicality for wearing when doing active Guiding. Guiders who are under 26 also count as members of the Senior Section, and they have opportunities to be involved in discussion groups, consultation exercises, forums and national consultations which aren't open to older Guiders.